People have different opinions on the time for the forming of Sichuan Opera. However, it is commonly recognised that Sichuan Opera was formed in the Qing Dynasty (1644 - 1912). Sichuan Opera is very popular in Chongqing, the east and centre of Sichuan, part of Yunan and Guizhou. Sichuan Opera mask plays an important role in the opera. The mask is a kind of treasure passed on from generation t generation among the artists of Sichuan Opera. Sichuan Opera is made up of five tone systems, including Pang-tzu(梆子, a kind of instrument) Kunqu Opera(昆曲), Huqin tone(胡琴), Dengdiao tone(灯调), and Gao Qiang(高腔, a kind of rhyme scheme of Chinese opera). There are five types of characters in Sichuan Opera, that is, the female character(旦角), the learned man(文生)the male character in Chinese opera with a painted face(花脸), the male character(生角), and the ugly male character(丑角, a bad guy or just a man wants to make funny things) among which, performances of the learned man, the female character and the ugly male character are the most featured. There are designated costumes for different characters. When the actors appear on the stage, their costumes reveal the identity, character, and emotion of the character. Face changing is one significant part in Sichuan Opera. Before the performance, the actors paint various patterns on the face in different colors of cosmetic brushes to show the identity, appearance and character of the character. For example, the mask for the loyal and honest characters, such as Guan Yu and Jiang Wei, is mostly red. Black is used to express straightforward and unselfish characters, such as Bao Gong. White is used to express ruthless, insidious and sinister characters, such as Cao Cao. Animals’ figures are also applied to express the characteristics of the character in face changing. The best time to enjoy Sichuan Opera is in the evening. The best months to visit is it is from March to May and from September to November as these months are not so cold or so hot. Shufeng Yayun (蜀风雅韵), address: Shufeng Yayun Teahouse in the City Cultural Park, No. 23, Qintai Road, Qingyang District, Chengdu (成都青羊区琴台路23号市文化公园内蜀风雅韵茶馆)；opening hours: 18:00 for the first show and 20:00 for the second show. The pricing may change during different time of the year. If interested, you can go to the backstage to see how the actors make up. They also offer the charged make-up if you would like to experience it. It is recommended that you arrive at the backstage 1 hour ahead to leave out time for make-up. It is suggested that you get to the theater 1 hour at least ahead. If you arrive at the theater at or later than its opening time, it is possible that you can’t go to the theater although you have booked the tickets online (Chinese apps if you can read Chinese). If you can’t understand Chinese, Wendy Wei Tours is always here of assistance to book the tickets and get them for you. At Shufeng Yayun, you can get a cattail leaf fan before the performance. After the performance, please return back it. 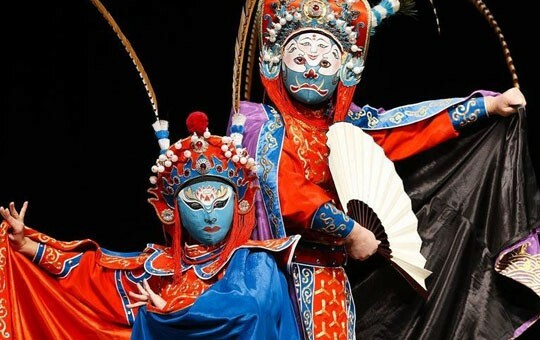 Interested in visiting the Sichuan Opera on a Tour? Wendy Wei Tours offers a variety of different packaged tours as well as custom tours including the Sichuan Opera, among other attractions and destinations. To find out more, please visit our Tours page or Contact Us directly to find out more.